While Redoute's Choice (AUS) (TrueNicks,SRO) has rapidly stamped himself as a sire of sires, his fellow Danehill son and erstwhile stud companion Flying Spur has been awaiting an heir. It now appears as if one may arrived in the shape of Casino Prince (AUS) (TrueNicks), who heads the Australia second-season sires list. He already has a star in the shape of four-time group I winner All Too Hard (AUS) (TrueNicks) (dam by Danzig's grandson, Desert Sun, so a Danzig/Danzig cross). One might be tempted to put All Too Hard down to his dam, Helsinge, who also produced none other than Black Caviar, but Casino Prince also has South Australian Derby (Aus-I) victor Escado (dam by Giant's Causeway (TrueNicks,SRO)), and group winners Longport (dam by Dolphin Street, from the Storm Bird line) and Sookie (dam by Encosta de Lago (AUS) (TrueNicks)). A second son of Flying Spur, Magnus (AUS) (TrueNicks), sits third on the table. He has three stakes winners to date, including group scorer Platinum Kingdom (dam by Giant's Causeway). As a Danzig son who in addition to his performances at classic trips was fast enough to take the King's Bishop Stakes (gr. I) at seven furlongs, and who has plenty of turf influences in his pedigree, Hard Spun (TrueNicks,SRO) looked to have a good shot in Australia, and he did complete 2012-13 as runner-up on the list. He has a trio of first-crop stakes winners in Western Blaze (dam by Marooned, from the Mill Reef line), Crystal Web (dam by Snippets), and Royal Haunt (dam by King's Best, by Kingmambo). Hard Spun is one of four Darley shuttle sires in this group, the others being Bernardini (TrueNicks,SRO), Street Sense (TrueNicks,SRO), and Any Given Saturday (TrueNicks,SRO). Bernardini is the current leading third-season sire, creating a small slice of history as we think he's the first Seattle Slew line horse to at any time head a sire list in Australia or New Zealand. His best in the Southern Hemisphere is Ruud Awakening, champion 2-year-old filly in New Zealand and winner of the Diamond Stakes (NZ-I), and he has a second group winner in Toydini. With an eye to the future, we can note that Ruud Awakening is out of a mare by Danehill, and Toydini from a daughter of the Danehill horse Johan Cruyff. Street Sense, who is now standing in Japan, hasn't been able to match the Southern Hemisphere success of his sire, Street Cry (IRE) (TrueNicks,SRO), although he's enjoying a very good season in the U.S. where he is the current leading third-crop sire. Any Given Saturday's credentials were little less obvious than Hard Spun's—not with standing that his sire, Distorted Humor (TrueNicks,SRO), did quite well from very limited opportunities with an Australian crops—and he is back in 18th here, although he does have stakes winner Saturday Skies out of a mare by Perugino (and so inbred to Distorted Humor's broodmare sire, Danzig). Chilean star and former Vinery Kentucky stallion Hussonet has three on the list in Host, Husson (ARG) (TrueNicks), and Husson Lightning. Host, a champion at 2 and 3 in Chile and a crack miler in the U.S., is a standout young sire in Victoria. He's getting plenty of winners, with his star being Philippi (dam by Encosta de Lago), winner of the Tulloch Stakes and Alister Clark Stakes (both Aus-II), and runner-up in the Australian Derby (Aus-I). Husson, who was champion 2-year-old and miler in Argentina, has started well with his sole South American crop, and in Australia has already been represented by group scorer Lucky Hussler (dam by Black Hawk, by Nureyev), and stakes winners Peron (out of a Flying Spur mare); Affable and Hussousa (both from Redoute's Choice daughters); and The Huntress (out of a mare by the Nijinsky II horse Western Symphony). The precocious Husson Lightning is still looking for his first black-type horse, but he has 22 winners from 58 starters. 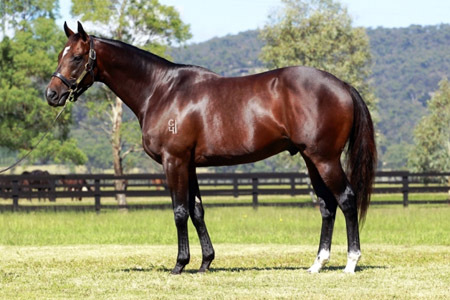 Purrealist (by Tale of the Cat), like Host based in Victoria, has a first-crop star in Hawkspur (dam by Catbird), whose trio of group victories includes the Queensland Derby (Aus-I). Fusaichi Pegasus (TrueNicks,SRO) is doubly represented here as he's responsible for both Haradasun (AUS) (TrueNicks) and Zizou. Haradasun, a champion in Australia and highweight miler in Europe, has been best represented by group II-winning and group I-placed Kabayan (out of a Don Eduardo mare, who is bred on a Sir Tristram/Danehill cross). Golden Slipper (Aus-I) runner-up Zizou has a trio of stakes horses in group-placed stakes winner Everage (dam by Snippets), group III-placed Marseille Roulette (dam by Pins (AUS) (TrueNicks), a son of Snippets, out of a mare by O'Reilly (NZ) (TrueNicks)) and Singapore group II winner Pitstop (dam by Al Hareb, a son of El Gran Senor, who in turn is a brother to Try My Best, the grandsire of O'Reilly). We haven't quite run out of young sons of Danehill, and two—Australian-bred Danehill Express and shuttler Dylan Thomas (IRE) (TrueNicks)—are ninth and 11th here. Runner-up in the Australian Guineas (Aus-I), Danehill Express has the Magic Millions Perth 3yo Trophy and Challenge Stakes winner Express Service (dam by Marooned) in his first get. Dylan Thomas's first Australian crop is headed by Dylan's Promise (dam by the Bletchingly line stallion Rigoletto), who took the Oaks (SAf-II) in South Africa.